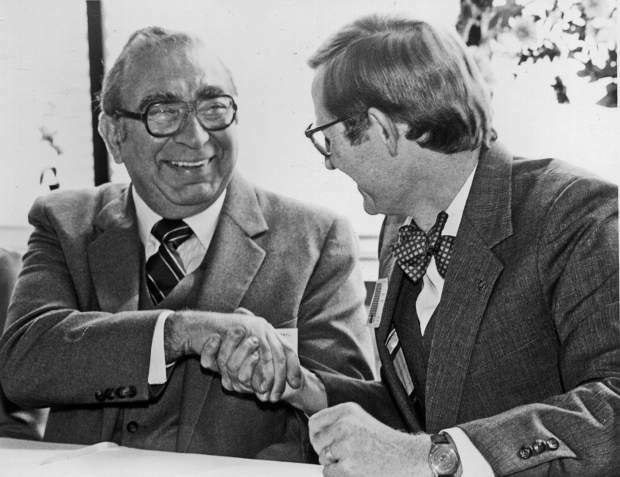 In 1986, University of Colorado-Boulder President Dr. Gordon Gee (right) rode the train to Glenwood Springs to sign a transfer agreement with interim CMC President Armen Sarafian. The agreement permitted CMC graduates to seamlessly transfer into CU as juniors. The Post Independent this year is celebrating local institutions’ anniversaries — including our own — with a special feature many Sundays through the year. The PI traces its roots back 127 years, but 125 as a daily, while the White River National Forest looks back on 125 years and Colorado Mountain College marks 50 years. Today we offer the sixth installment of CMC history. By the early 1980s, Colorado Mountain College expanded in ways not even its founders had envisioned. 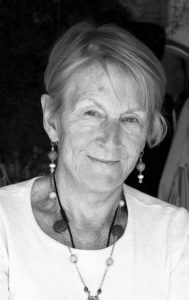 In 1981, voters of the Steamboat Springs school district in Routt County opted to join the Colorado Mountain College district, increasing their own taxes to do so. CMC adopted the abandoned campus facilities of a struggling Steamboat Springs college. That school included dorms, so the addition became CMC’s third residential campus, along with Spring Valley and Leadville. 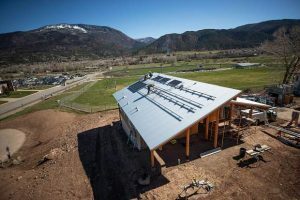 It joined the multiple community-based college centers offering continuing education and professional development in Aspen, Carbondale, Glenwood Springs, Rifle, Eagle, Vail, Breckenridge and Chaffee County. By the middle of the decade, the growing but still young CMC also faced its biggest test of all, one that threatened its very existence as a locally controlled college. On May 2, 1982, Exxon shut down its massive oil shale operations in western Garfield County. Known as “Black Sunday,” the shutdown happened without warning, sending the region’s economy into a tailspin. More than 2,000 individuals lost their jobs. Related industries and services also felt the ripple, and thousands of people moved out of the area. CMC’s Spring Valley area dean, Arnie Dollase, oversaw college operations between Aspen and Rifle. 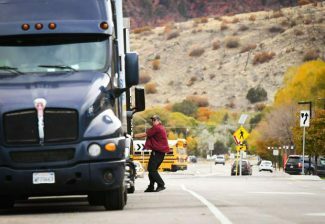 The unexpected closure put an immediate halt to the college’s plans to provide vocational training for oil shale workers. “It fell away in an instant,” Dollase recalled. “Our long-term planning had vaporized.” The Rifle campus lost almost 300 students, and the college suffered a decrease in tax revenue from the oil shale industry. In the two years following Black Sunday, the region’s businesses and industries were gripped by a major national recession. CMC was likewise affected and needed to make big changes – some painful ones that meant staff and faculty reductions. Coincidentally during this time, a small group of taxpayers petitioned for the dissolution of the CMC district and argued the college should be taken over by the state system of community colleges. Before the dissolution proposition came to a vote, the state system studied whether it would consider absorbing CMC under its umbrella. The bid was rejected and CMC retained its status as a local district college. Former CMC Vice President Steve Mills credits the college’s expansion into communities, the resulting strong base of local support. 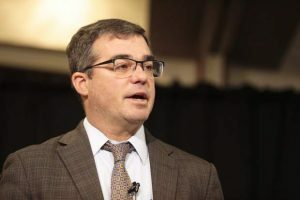 “I think it was the strength of the outreach program that allowed the college to remain as a local district college, which to this day is the one of the true values of the college,” he said. The young college brushed off the dust from its early 1980s challenges and pressed onward. By the middle of the decade, CMC had added an associate of science degree to its offerings and was formally awarded a longer-term accreditation status by the North Central Association of Colleges and Schools. In 1986, staff and faculty arranged the first comprehensive transfer agreement between a two-year college and the University of Colorado at Boulder. CMC courses were recognized as CU equals. CMC students who successfully completed a two-year degree would be guaranteed transfer of their credits to the university and enter as juniors, needing only two more years to earn their bachelor’s degrees. Subsequently, more transfer agreements were signed, and CMC’s core courses are presently part of Colorado’s common curriculum and are guaranteed to transfer to all public colleges and universities in the state.